Angel Falls (Spanish: Salto Ángel; Pemon language: Kerepakupai Vená, meaning "waterfall of the deepest place", or Parakupá Vená, meaning "the fall from the highest point is a waterfall in Venezuela. It is the world's highest uninterrupted waterfall, with a height of 979 m (3,212 ft) and a plunge of 807 m (2,648 ft). 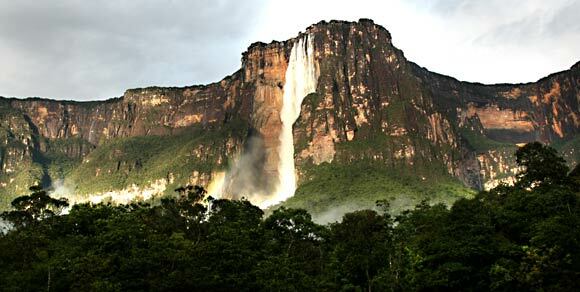 The waterfall drops over the edge of the Auyantepui mountain in the Canaima National Park (Spanish: Parque Nacional Canaima), a UNESCO World Heritage site in the Gran Sabana region of Bolívar State. The height figure 979 m (3,212 ft) mostly consists of the main plunge but also includes about 400 m (0.25 mi) of sloped cascades and rapids below the drop and a 30-metre (98 ft) high plunge downstream of the talus rapids. 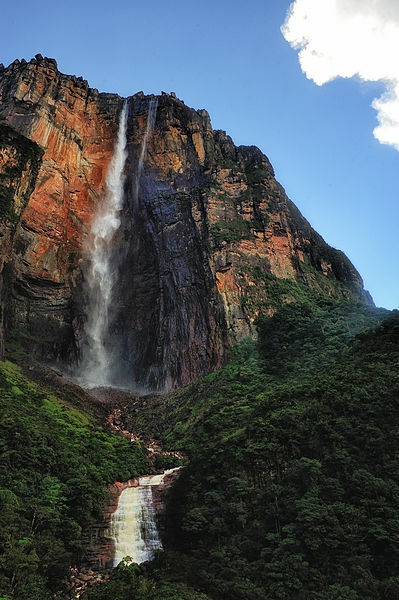 Angel Falls is one of Venezuela's top tourist attractions, though a trip to the falls is a complicated affair. The falls are located in an isolated jungle, and a flight from Puerto Ordaz or Ciudad Bolívar is required to reach Canaima camp, the starting point for river trips to the base of the falls. River trips generally take place from June to December, when the rivers are deep enough for the wooden curiaras used by the Pemon guides. During the dry season (December to March) there is less water seen than in the other months.